Use the Blog2Social plugin to share and cross-promote your blog posts automatically to your social media channels, directly from the WordPress dashboard. The plugin allows you to auto-post and to customize your posts individually for each network. You can also schedule your posts to be shared at the best times to post on each network. The plugin auto-posts your blog posts to Facebook (profiles, pages), Twitter, Google+ (profiles, pages, groups), LinkedIn (profiles, pages), XING (profiles, pages, groups), Diigo and Reddit, to Tumblr, Medium, Torial for re-publishing your post, as well as your images on Instagram, Flickr and Pinterest. You may also re-post old post and pre-schedule your scheduled post for auto-posting. Use the Blog2Social plugin to re-publish your blog post to Tumblr, Medium, Torial automatically. The plugin provides a full Rich Text Editor for these networks, so you can optionally edit your title and copy or even change your image, if needed. And, most importantly, you can schedule your post to get them re-published on different days and times. Use Powerpoint or Google Slides to create a simple presentation of your blog post. You can create a mp4 or .wmv file to use them as video. Use networks like Kred or Klout to find influencers in your niche and topics by keyword search. Get the Google Analytics Dashboard plugin for your blog. If you’re regularly checking your stats on page views and performance of your posts, the plugin helps you keeping track of your stats more quickly and conveniently. Try Crazy egg to visualize where your visitors click on your blog and your post. Try SumAll to leverage your social media data to create data-driven content. As you see, there are many things you can do to make the best out of your blog post. And a lot to think about, every time you publish a new post. Checklists are an ultimate time-saving device for writing and promoting flawless blog posts. Following a checklist makes sure you don’t forget anything, even if you have a tight deadline to meet. Once you've put so much effort into writing your post, it would be stupid to forget some minor things that can crash your potential. Every pilot works with a checklist before each and every takeoff, so don't think you don't need one, just because you have already written a couple of posts. 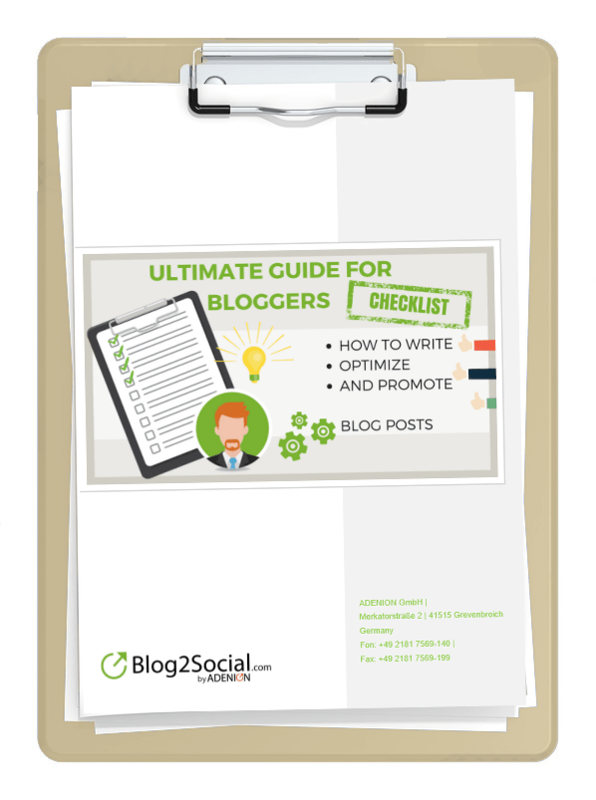 Download this guide and a free checklist to make you have everything in place for writing and promoting your next blog post.